Luscious strawberries, sweet and tangy with an intense fruit flavor, are a must-have for any serious gardener. A raised bed is ideal for strawberries. It provides the rich soil they require, gets the strawberries above ground level and away from snails and slugs, and is easier to protect from birds. Raised beds are not difficult to build. The best strawberries for raised beds are everbearing, which means they flower and have immature and ripe fruits simultaneously. Choose a location that receives eight hours of sunlight a day. Outline the bed with cinder blocks, stacked bricks or stones, or railroad ties to a height of at least 12 inches, preferably 18 inches. Lay folded newspapers 1/2 inch thick or shredded paper 6 inches thick over the bottom of the bed to kill any grass or weeds. Fill the bed with 2-inch layers of compost, top soil and potting soil. Add slow-release fertilizer per package directions when you get within 2 inches of the top of the bed. Mix everything with a shovel. Don't disturb the underlying layer of paper. Rake smooth. Water to settle the soil. Add additional layers if necessary to bring the bed back up to within 2 inches of the top. 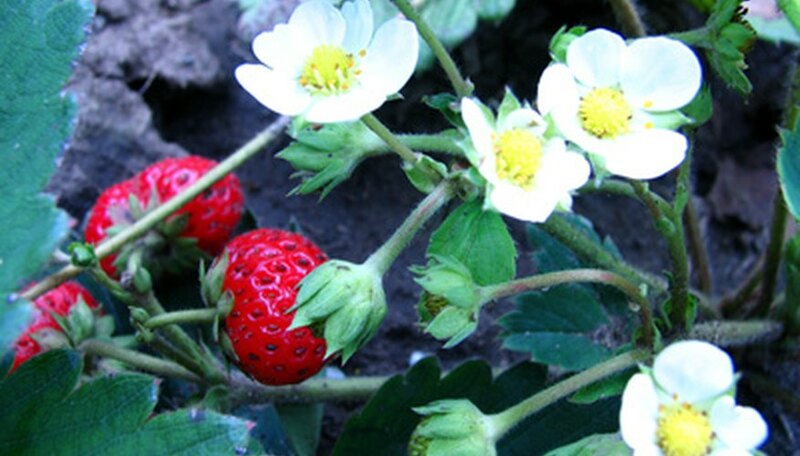 Dip the root ball of each strawberry plant in water-soluble plant food at half strength before planting. Plant 12 inches apart with the crown at soil level. Water until the soil is wet to a depth of 6 inches. Outline a square with bricks or other material to a height of 12 inches. Fill with soil, compost and potting soil as above. Outline a second square with bricks to a height of 12 inches toward the center of the first square. Leave 12 inches between the sides of the two squares. Fill with the soil mixture to the top. Move inside the second square an additional 1 foot and make the final inside square. Fill with soil mixture. The end result is a tiered bed with the first tier 12 inches above the ground, the second tier 24 inches above the ground and the final tier 36 inches above the ground. Plant the strawberries as instructed above in Step 5. Strawberries require about 1 square foot per plant. Logs cut in 24-inch lengths and buried to stand upright may be used as liners for the planting bed. Wooden 2x4s nailed together also work well. The choice depends on how long you want the bed to last and how attractive you want it to be. Newspaper eventually will decompose and add organic matter to the soil. Natural materials such as wood may attract snails and slugs. Place dishes of beer or fruit juice to attract them. They will drown. Wear gloves when handling fertilizers.